Caftan Woman: 1967 in Film Blogathon: Who's Minding the Mint? 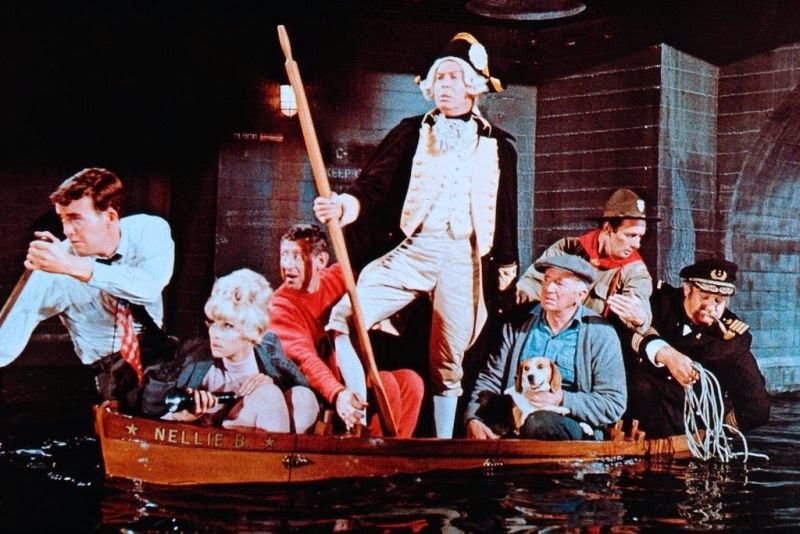 Today we travel to 1967 in Film for a blogathon co-sponsored by Silver Screenings and The Rosebud Cinema. Canada celebrated its Centennial in 1967 and the most successful World's Fair of the 20th century, Expo '67, made Montreal a happening destination. I received my first wristwatch for my 10th birthday. Little Women was my favourite book, The Jungle Book my favourite movie and my favourite pop groups were The Seekers and The 5th Dimension. I loved to snack on Humpty Dumpty Potato Chips and Buried Treasure ice cream treats. All my TV crushes wore cowboy hats. My observations of adults in general, and the goings on on Search for Tomorrow in particular, led me to the conclusion that grown-ups were a screwy and emotional lot, and I feared for my impending journey into adulthood. It was all downhill from here! It is perhaps a good thing that I didn't see Who's Minding the Mint? as a serious minded 10-year-old. Talk about your screwballs! Harry Lucas (Jim Hutton, TVs Ellery Queen) is a man with a plan. By day he is an average, fairly disgruntled wage slave at the U.S. Mint. 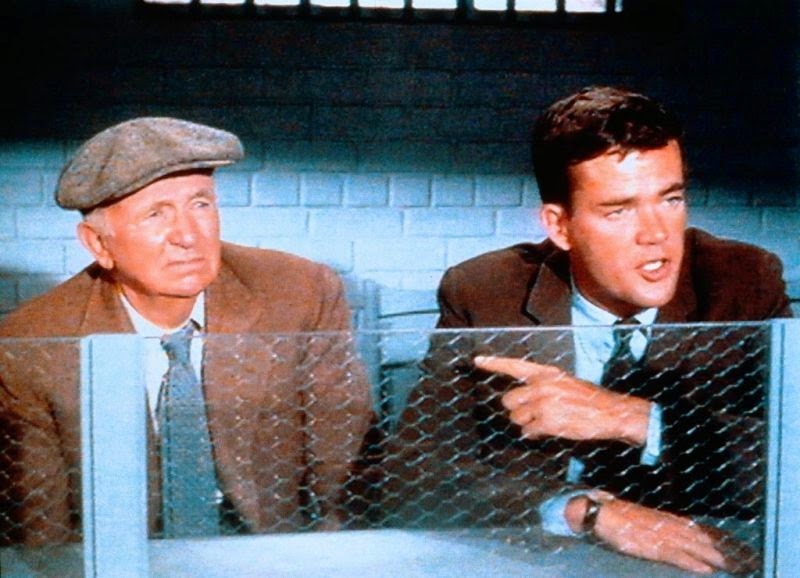 He draws to himself the unwanted friendship of old coots (Walter Brennan, TVs The Real McCoys) and pups, the unlooked for romantic attentions of nice girls (Dorothy Provine, TVs The Roaring Twenties), and the suspicions of officious middle management types (David J. Stewart, TVs The Defenders). By night, courtesy of sample promotions and installment plans, Harry lives the high life with snazzy cars, snazzy apartments, snazzy suits and snazzier dames. Life is good until fate places Harry in a sticky situation making him responsible for the loss of 50,000 samples of his employer's product. Harry needs another plan. Somehow he must replace what has been lost before the long arm of the law puts the kibosh on all that is snazzy. His pal Pop can help as he wants one more kick at the presses before his retirement forced by a soon to be implemented automated system. Verna, whose affection is behind the trouble, can access necessary plates and would do anything for Harry. It's a start. The services of a safe cracker are required and Pop knows just the man. Avery Dugan (Jack Gilford, TVs Soap) is about to get out of the Pen. He's down on his luck and hard of hearing. Every gang needs a deaf safe cracker! Armies march on their stomachs and crooks on a big job need backing and supplies. Meet Luther Burton (Milton Berle, TVs The Milton Berle Show), a pawnbroker with a generous streak of larceny. Entering such a visible edifice as the Mint in the dead of night requires stealth and knowledge of the city's underground tunnel system. Meet the sewer guy, Ralph Randazzo (Joey Bishop, TVs The Joey Bishop Show) who is always short of funds. For lookout there is Ralph's cousin Mario (Jamie Farr, TVs M*A*S*H). English is his second language, or would be if he had a second language. Their entry to and exit from the underground tunnel system is located under a most inconvenient window. There must be a way to keep the apartment's occupant occupied. Awkward ice cream peddler Willie Owens (Bob Denver, TVs Gilligan's Island) is like catnip to kooky artist Imogene (Jackie Joseph, TVs The Doris Day Show). He'll keep her busy! The atmosphere of sewers being somewhat damp, it is determined that watercraft of some description be obtained for the reverse raid. You will never meet a more stalwart and focused mariner than "Captain" (Victor Buono, TVs Batman). Perhaps as a fan of the movie you have your favourite from among the zanies in the cast. Mine is Victor Buono as "Captain". I have only to think about his accent and his single-intentioned performance to lapse into convulsions. Harry is a man with a gang or does the gang have Harry? What's a few minutes more in the Mint? What's a few more runs of the press for a few dollars more evenly split among the worthies? It is the way of all heist flicks that one thing interferes with the strength of a well-rehearsed plan and so it is with ours when the Mint moves up the date of automation. You know how it is when you've planned something one way and suddenly it's not how you expect. There will be glitches and these glitches in Who's Minding the Mint? are hysterically and impeccably funny as these mismatched misfits of mayhem doggedly carry out "the plan". Who's Minding the Mint? is my idea of the perfect 1960s comedy. 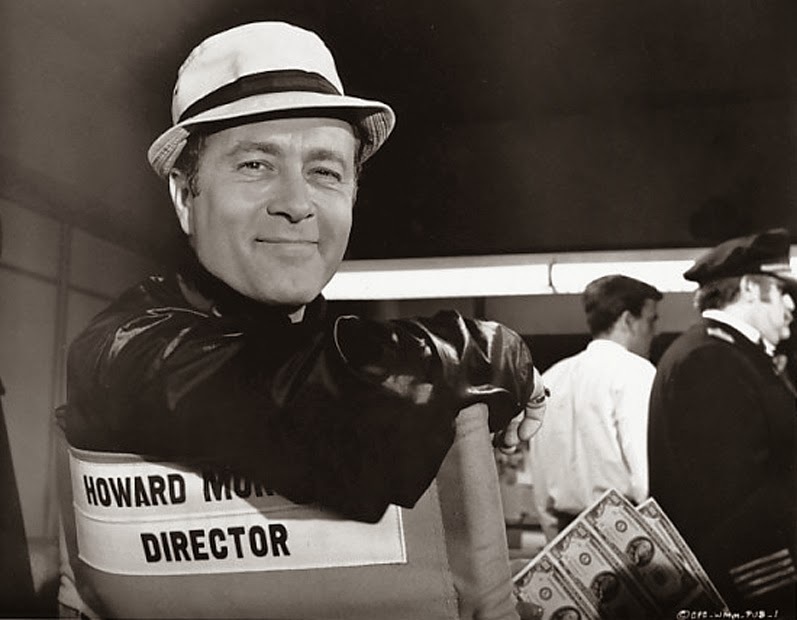 How can it fail being directed by a certifiable genius in the comedy line, Howard Morris (TVs Caesar's Hour, immortal as Ernest T. Bass on The Andy Griffith Show, Hanna-Barbera performer)? Under Morris' direction the consummate ensemble plays the witty lines and sight-gags for maximum effect. The score by Lalo Schrifin has the driving insistence of his Mission Impossible theme, but with a goofy, off-kilter bounce. The sights and sounds of Who's Minding the Mint? bring me back to the world of yesterday and makes today just that much more amusing with its all or nothing wackiness. I loved this movie when it first came out -- I was also 10 in 1967. Thanks for the memories -- you helped me recall some plot elements that I'd forgotten. I once interviewed Andy Griffith and asked him how Howard Morris was chosen for Ernest T. Bass. He said something to the effect of, "After seeing him on Your Show of Shows, how could you NOT cast him?" Griffith's assessment of Howard Morris is marvelous. I'll be smiling about that one all day. 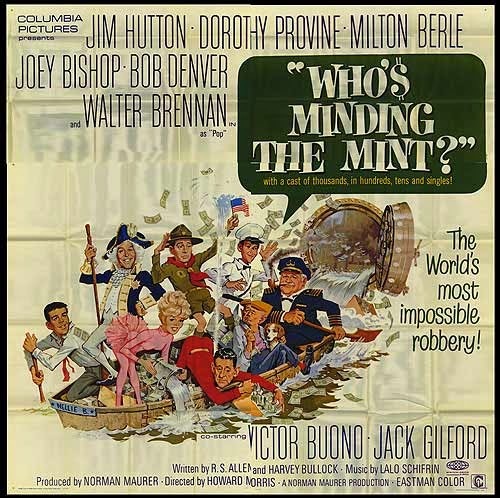 I didn't catch "Who's Minding the Mint?" for the first time until I was about 16 and I've loved it ever since. This looks like so much fun! I've heard about this film for a long time but have never had the chance to see it. And such a cast! How can it go wrong? Will look up Netflix – hopefully they have it. If you don't get a kick out of this movie, I'll eat my hat! I like the poster. I wish more movie posters used illustrators. I find it very appealing as well. I can't say that about the sameness is today's publicity. Buried Treasure ice cream treats....gosh, that sounds good. I'm so glad you chose to highlight Who's Minding the Mint?. It's one of our favorite comedies and yet it seems to be very obscure, even among avid film fans. Jim Hutton was perfect in roles like Harry. Buried Treasure: vanilla ice cream and orange sherbert on a plastic stick. When you finished off the ice cream there was a "statue" on the stick - a ballerina, a cowboy, an animal, etc. Yummy! Yummy as well for Jim Hutton (if I may be so bold). This movie sounds fun! I'm always glad to find another comedy heist movie I haven't seen before. :) Love this line: "before the long arm of the law puts the kibosh on all that is snazzy." My recommendation is wholehearted. I would be surprised to run across someone who wouldn't enjoy "Who's Minding the Mint?". It is a real treat. Keep your eyes open for TV screenings. This looks like fun! I've recently discovered an appreciation for 60s capers; sometimes all you need in life is a madcap comedy. "...sometimes all you need in life is a madcap comedy." This sounds like a perfect movei for a Saturday / Sunday evening! I hope I can see it someday. And, yes, Lalo's scores are always a plus in any movie. The right score can make or break a film that relies on visuals. Lalo really makes it work.